ORDINARY MOMMY DESIGN: The Daily Galette. 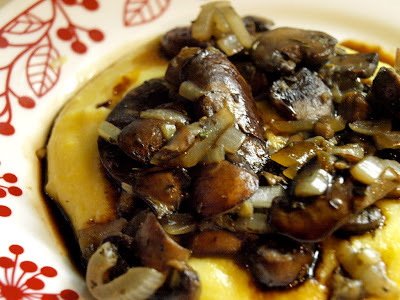 polenta with sauteed mushrooms and onions. Well, it's Friday again! It is promising to be absolutely lovely here in Pennsylvania this weekend. We'll be having some of those wonderful Autumn days where the sun is hot, but there is a slight nip in the breeze and the sun reflects off of the leaves as they begin to turn orange, yellow, and red. I wanted to take a minute to introduce you to my sister, Bethany's, brand new food blog, The Daily Galette! She loves to cook (and grocery shop), and if her dog stays out of mischief long enough, she seems to find plenty of time to have fun in the kitchen. So stop by and take a peek. That photo up above is from her last post, and it makes my mouth water every time I see those perfectly browned mushrooms. Also, as per the random number generator, the winner of the flower hair clip is Jeanine of The Crafting Fiend! Thanks to everyone who stopped by.